As Shin Godzilla hits UK cinemas, we look at the screen history of the iconic Japanese movie monster. Godzilla first came to life on the silver screen in 1954 with the film simply titled Gojira (Godzilla). This film was inspired by its producer, Tomoyuki Tanaka, previously viewing The Beast from 20,000 Fathoms on a visit to America. Focussing on the remaining fear caused by the comparatively recent atomic bombings of Japan, director Ishiro Honda created a monster that was nuclear holocaust incarnate. Godzilla is a film unique in tone from the rest of the series that would follow, and it's easy to see how this powerful movie would launch the colossal series of films that followed. If you haven't seen the original Japanese version of this film you really need to, even if you are not a Godzilla or monster movie fan. This is a horrific disaster movie and a powerful film that deserves every accolade it receives. Given such an incredibly high bar, it is therefore not surprising that none of the sequels would ever live up to the quality level of the original. Godzilla launched a series of films that can be broken into three eras. The first is called the Showa era series, named after the sitting Japanese emperor at the time. 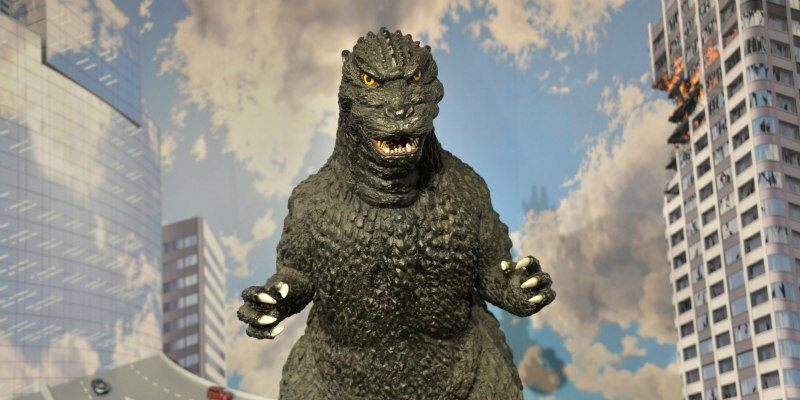 I personally consider the Americanised version of the first film, Godzilla: King of the Monsters, to be the first sequel to the original film, as this version of the film was heavily edited to add scenes of actor Raymond Burr playing a US reporter covering the events of Godzilla's attack on Japan. This editing was also used to seriously tone down the horrific impact of the original. The first actual sequel to the original film was Godzilla Raids Again, which would be one of only two Showa era films not directed by Honda or subsequent director Jun Fukuda. The success of King of the Monsters in the US was such that a movie titled The Volcano Monsters was planned, to be based off of Godzilla Raids Again, but with much more extensive re-shooting to move the action to America. Unfortunately, the production company working on the project shut down and instead the original film was dubbed, and in what can only be described as a complete lack of appreciation of the term "star power", was released as Gigantis the Fire Monster. A final interesting note on this film is that it launched the career of actor George Takei, who was one of the voice actors used in the dubbing of the film. The sequel's lack of critical success would result in a seven year gap before the release of King Kong vs. Godzilla. This film was based upon an idea by Kong creator Willis O'Brien, titled King Kong vs. Frankenstein. As an homage to King Kong, there is a brief stop motion animated scene during the fight on Mount Fuji where this technique is used with the suit-mation actors. The scene is so short, one could easily miss it. This movie also brought Godzilla into colour, and, being a more comedic entry, began the shift of the franchise towards a younger audience. This is also a unique film for me in that I actually prefer the Americanised version of the film over the original Japanese one. From here the Showa series went on with a huge number of films. The next would bring Toho's other big monster star, Mothra, into the series in Mothra vs. Godzilla (Godzilla vs. the Thing). Alien invasion would become a major component of the following two films, Ghidorah the Three Headed Monster and Invasion of the Astro Monsters, which also introduced Godzilla's first serious adversary, in the form of Ghidorah, who would go on to become a staple of the series. The next pair of films feature the premiere of the other major director of the Showa era films in the person of Jun Fukuda. His first two films, Godzilla vs the Sea Monster and Son of Godzilla were set on islands in the South Pacific and seriously shifted the franchise to the juvenile market. Although, to be fair to Mr. Fukuda, this shift could have been the result of the influence of visual effects director Eiji Tsuburaya. I'll state up front that I'm not that big a fan of Fukuda's work on the Godzilla franchise. In every interview I have ever read with Fukuda he has always come across to me as viewing Godzilla as being beneath him as a director. These two movies do little to change my perspective, especially with their kaiju, which are nothing more than giant animals (a shrimp and spider, respectively). Fortunately, we quickly see the return of Mr. Honda, along with more aliens, in the epic Destroy All Monsters. This was followed by another Honda film in the form of Godzilla's Revenge, or All Monsters Attack in the original Japanese. This film regularly gets thrown under the bus as the worst of the franchise but in my opinion we are still a couple of films away from that. I think what Revenge suffers from - apart from the generous use of recycled footage and the return of Godzilla's son Minya, who is also unfortunately a main character - is the fact that it's actually a film about growing up in Japan that uses Godzilla as window dressing. When viewed in that light, it is not quite the disaster that most Godzilla fans see it as. The next film, Godzilla vs. Hedorah (aka The Smog Monster) is the only other non-Honda/Fukuda film of the Showa era. It also leads us into the films of the era where Godzilla really becomes a straight up hero. Hedorah also regularly gets tossed under the bus as not only the worst Godzilla film of all time but one of the worst movies ever made. My thoughts on people who believe this is that they are clearly inexperienced film viewers. To get back on topic, this is actually one of my favorite Godzilla films, as it features an attempt to take the series in a new direction while seriously attempting to return the franchise to its horror roots. Unfortunately, the director got cold feet at the last second upon seeing how dark his film was and decided to add the now infamous Godzilla flying scene to try and lighten the mood. Instead, it had the effect of completely destroying the overall tone of the film, and reduces it to the laughing stock it's largely viewed as today. Tomoyuki Tanaka, still the franchise's producer at the time, hated the film, and is rumored to have told the director that he had destroyed the Godzilla franchise with it. As a result, we see a return of Mr. Fakuda for the next three of the Showa era's final four films. Godzilla vs. Gigan, while featuring an incredibly cool cybernetic kaiju, also has incredibly poor visual effects and a return to the overuse of stock footage. Godzilla vs. Megalon comes across to me as even more of an Ultraman episode than a Godzilla film and not just because of the addition of the robot Jet Jaguar. Megalon is still one of the most popular films in the franchise, due to an incredibly aggressive American marketing campaign on the film's US release. The last two films of the era would feature what would become one of the most popular kaiju of the franchise in the form of Mechagodzilla and, with the final film, Terror of Mechagodzilla, the return of Ishiro Honda as director of what would be his final Godzilla film to finish out the Showa era series. After Terror of Mechgodzilla, Toho decided to give the character a rest. This break lasted nine years and brings us to the Heisei era Godzilla films. The first was The Return of Godzilla in 1984, which was created as a sequel to the events in the 1954 film, thus eschewing 13 films' worth of continuity. Like the original film, Return of Godzilla was heavily edited for a US release as Godzilla 1985, to include Raymond Burr reprising his role from King of the Monsters. This time around the changes to the film's story and tone were not as drastic as in the case of the 1954 original. It would be another five year gap before the Heisei series kicked into regular gear with the release of one of the most unique entries in the franchise history, Godzilla vs. Biollante. This is another one of my favourites, as it again attempts to take the series into new terrain, including making the enemy kaiju a genetically engineered plant. Starting in 1991 with Godzilla vs King Ghidorah, four more films would be released on an annual basis. This series would bring a mix of new as well as reinvented Showa era kaiju. The Heisei series had a much greater focus on continuity than the Showa, but it also had only half the number of films released in a much shorter time span, making it easier to do so. The visual effects are markedly improved, although the kaiju themselves are less dynamic than their Showa era counterparts. Contributing further to this, every kaiju in this era seemed to come equipped with some sort of breath or eye weapon, resulting in a lot of highly static "battles of the beams" as the fans would come to call them. My favourites of this series are the earlier mentioned Biollante, Mechagodzilla II and Destroyer. I also really liked the kaiju design and concept of Mecha-King Ghidorah and Space Godzilla but, unfortunately, the first of these films was saddled with a wonky time travel plot, while the second suffers from a serious lack of story. The Heisei era ended when it was announced the team of Dean Devlin and Roland Emmerich would be bringing Godzilla to American audiences in a big budget summer blockbuster. My feelings about the film are diplomatically described by someone who said it would have been a much better giant monster film had it not been called Godzilla. This finally brings us to the Millennium series, starting in 1999 with Godzilla 2000. Like the Heisei series before, Toho decided this movie would be a sequel to the first film only. In fact, this became the model for almost all of the Millennium series, in that each would be a sequel to the original '54 movie. The results are a somewhat mixed bag. The first in the series featured another alien invasion plot. The second film, Godzilla vs. Megaguirus looks like a sequel to 2000, due to the use of the same Godzilla suit, but it isn't really, and I found it to be a considerably more entertaining film. The next movie, Godzilla, Mothra, King Ghidorah: Giant Monsters All-Out Attack was noteworthy for being directed by Shusuke Kaneko, whose previous reinvented Gamera trilogy are three of the best kaiju films ever made. Unfortunately, his directing skills didn't transfer quite as well to the Godzilla franchise. The next two films break the pattern of the rest of the Millennium series in that they are both made by the same director and acknowledge other Toho kaiju films as part of their continuity. Also, the second film is a sequel to the first. They also both featured the return of Mechagodzilla in the form of Kiryu, a truly cybernetic kaiju built on the skeleton of the original Godzilla. The Millennium series came to an end with Godzilla: Final Wars. This film was nominally a remake of Destroy All Monsters, with tributes not only to most of the previous era Godzilla films, but to other Toho kaiju films as well. After this film, Toho announced they were putting the character to rest again, but if there is one thing any true Godzilla fan knows, it's that he can never really be permanently destroyed, and so we have Shin Godzilla and its planned sequels.